Schoolhouse Ronk: Decking the Halls! The Halls are Decked! We don't have a Christmas Tree this year. We actually haven't had one since our first Christmas together back in 2006. We will have one next year though no matter what! 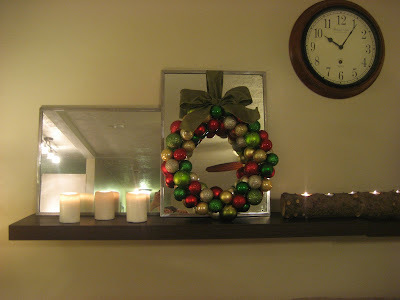 I made 2 Ornament Wreaths with Dollar Tree Ornaments! I absolutely love how they turned out but I think that this might have been the most frustrating project ever! It was like a puzzle trying to get the colors and sizes of ornaments to look right! If you want to make one click here. 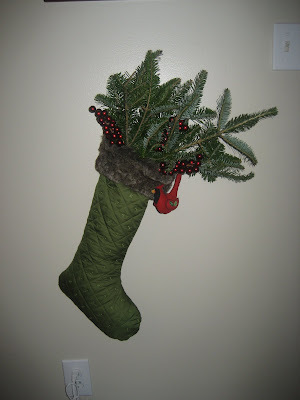 A few years ago Grandma Marcy got me this cute stocking from Eddie Bauer. I took some branches from The Payne's Christmas tree and stuck them in there with a few berry picks and then I hung a little felt cardinal ornament on there. It smells all pine-y which I love! 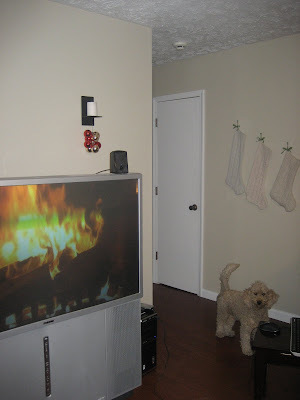 The Stockings are hung by the fire! 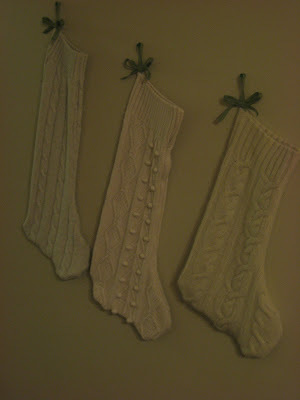 :) For the stockings, I took cream colored sweaters from Goodwill and flipped them inside out and then took a sharpie and drew a stocking shape and then just stitched over the sharpie cut around the part that was sewn and then flipped them back to right side out! 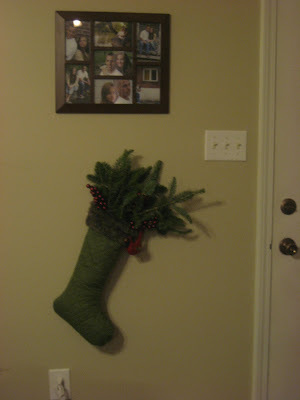 Super Easy Stockings! I like them but they would look much better on a different color wall so that they wouldn't blend in so much. 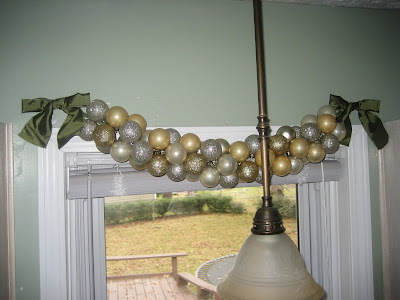 I took some of the leftover dollar store ornaments and made this swag for above the window in the kitchen! I love it but I dropped the stupid thing twice while I was trying to hang it. Since that window is above the sink it fell into a dirty pot of water.... twice.... I love it though and I am thinking about leaving it up! I wont but I want too! 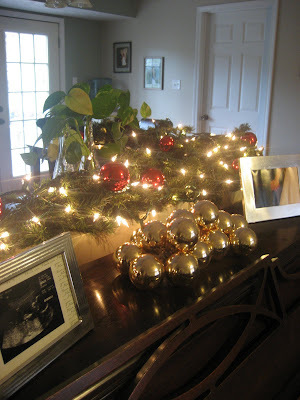 Over our "bar" I have a garland strung with Christmas lights and filled with some of my red glass ornaments and on top of the piano I have some of my gold glass ornaments that I strung with pearls from our wedding so that they would stay clumped together. 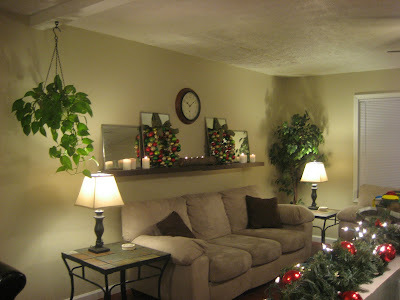 So that is it for the Ronk households 2009 Christmas Decor. 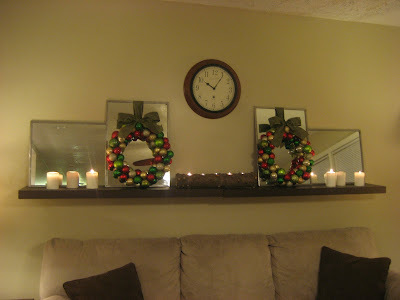 I had plans for wreaths in our room and Kenley's room but I just ran out of time! Next Year! I just love the swag you made. I think I will have to try this next year. Thanks for the idea. I love the fireplace, too. So funny! Looks nice,Keri, I like the swag over the sink too.